BURLINGTON, Vt. -- U.S. Sen. Bernie Sanders on Tuesday called on Americans from all over the nation to join him in building a massive grassroots movement to win the Democratic nomination, defeat Donald Trump and enact an agenda that serves all people, not just the few. 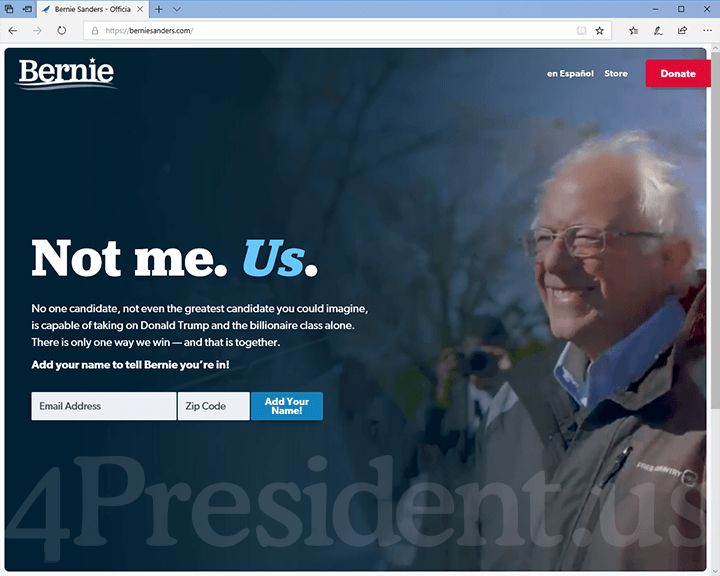 In an email to supporters, Sanders said he is more optimistic than ever that the country is poised to take on powerful special interests, guarantee health care as a right, raise workers’ wages, make public colleges and universities tuition free, address the crises facing rural America, transform our energy system to combat climate change, lower prescription drug prices and defeat the forces of racism, sexism and xenophobia. “Three years ago, when we talked about these and other ideas, we were told that they were ‘radical’ and ‘extreme,’" Sanders wrote in the email. "Well, three years have come and gone. And, as result of millions of Americans standing up and fighting back, all of these policies are now supported by a majority of Americans. In the next few weeks, Sanders will a launch multi-state tour to share his vision to transform the country for the many, not the few. I am writing to let you know I have decided to run for president of the United States. I am asking you to join me today as part of an unprecedented and historic grassroots campaign that will begin with at least a million people from across the country. Our campaign is about taking on the powerful special interests that dominate our economic and political life. I'm talking about Wall Street, the health insurance companies, the drug companies, the fossil fuel industry, the military industrial complex, the private prison industry and the large multinational corporations that exert such an enormous influence over our lives. Our campaign is about creating a government and economy that work for the many, not just the few. We are the wealthiest nation in the history of the world. We should not have grotesque levels of wealth inequality in which three billionaires own more wealth than the bottom half of the country. We should not have 30 million Americans without any health insurance, even more who are underinsured and a nation in which life expectancy is actually in decline. The only way we will win this election and create a government and economy that work for all is with a grassroots movement – the likes of which has never been seen in American history. I'm running for president because we need to have the best educated workforce in the world. It is totally counterproductive for our future that millions of Americans are carrying outrageous levels of student debt, while many others cannot afford the high cost of higher education. That is why we need to make public colleges and universities tuition free and lower student debt. I’m running for president because we must defend a woman’s right to control her own body against massive political attacks taking place at the local, state and federal level. Three years ago, during our 2016 campaign, when we brought forth our progressive agenda we were told that our ideas were "radical" and "extreme." We were told that Medicare for All, a $15 an hour minimum wage, free tuition at public colleges and universities, aggressively combating climate change, demanding that the wealthy start paying their fair share of taxes, were all concepts that the American people would never accept. Will you stand with me as part of a million person grassroots movement which can not only win the Democratic primary, not only win the general election, but most importantly help transform this country so that, finally, we have a government that works for all of us and not just the few? Add your name to say you will.